Please note: Buses departure from the bus station in Dubrovnik. 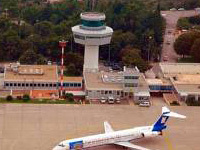 If you are travelling from Dubrovnik airport, you have to first take the airport bus to the main bus station, alternatively you can arrange a transfer from Dubrovnik airport directly to Vela Luka or to the bus terminal. Note: oftten the bus on Sunday leaves at 18:00 PM and not at 15:00 PM please double check. After every flight arrival of every flight company a Croatia Airlines bus will be waiting outside the airport.The bus takes you straight to the ferry port for 5 euro (35 Kuna). You can buy the ticket after you take your seat and you can pay in Euro or local currency. The bus close to the ferry port where you can buy your ferry ticket to Korcula. If you have a few hours to spend before your ferry leaves, you can store your luggage in the luggage depot for as small fee. It is safe as this service is run by the government. Visit Dubrovnik town, have something to eat, get a sun-tan, visit the market or drink something in one of the many terraces around. 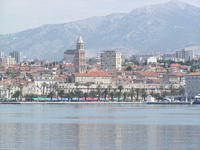 If you drive in the direction of Split, after about 35 Km you take a right onto the Peninsula. 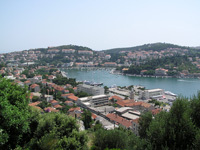 Drive all the way to Orebic and take the little car ferry to Domince / Korcula island. From there continue to Vela Luka! The Toll fees can be paid with any currency also the Euro. There are many fuel stations on the highway with toilet and coffee facilities, but if you go off the highway there are not that many fuel stations so we advise you fill up your tank regularly and start looking for a fuel station when your tank get's half full. Fuel stations only accept local currency ( not the Euro etc) but they do accept credit cards - visa, mastercard etc. We advise you not to change money in the local tourist offices / exchange bureaus as the banks have the best & non-commission rates. ATMs can be found just about everywhere!